(Optional) Clear ahriman directly west of the zone entrance. These can also be avoided by following the wall closely to the north. Alliances stage northwest of the first time extension (Tombstone Prototype 94). (Optional) Clear ahriman to the the first time extension. It is also possible to pull one Vanguard Eye without linking the rest, allowing mages to get in close enough to kill the time extension. Avoiding Vanguard Eyes 188, 192, and 196, clear ahriman to the west, including time extension Icon Prototype 382. See notes below for details. 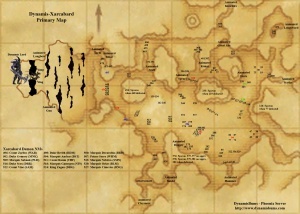 Proceed north, avoiding Vanguard Eyes 337 and 358. Clear Vanguard Eyes 219, 224, 228, and time extension Tombstone Prototype 233. To avoid future linking, pull and clear Vanguard Eye 344. Clear Vanguard Eyes 496-500, including NMs Count Zaebos (WAR), Duke Berith (RDM), and Marquis Decarabia (BRD). Clear Vanguard Eyes 502-507, including NMs Duke Gomory (MNK), Marquis Andras (BST), and Prince Seere (WHM). Clear Vanguard Eyes 516-520, including NMs Duke Scox (DRK), Marquis Gamygyn (NIN), and Marquis Orias (BLM). Clear Vanguard Eyes 509-513, including NMs Marquis Sabnak (PLD), Count Raum (THF), and Marquis Nebiros (SMN). Clear Vanguard Eyes 522-527, including NMs Count Vine (SAM), King Zagan (DRG), and Marquis Cimeries (RNG). Pull and clear time extension Statue Prototype 529. Clear ahriman to final time extension, Statue Prototype 454. Clear Vanguard Dragons. It is not necessary to kill all ten, but many of them are in the way of potential kiting routes. Clear Ying and Yang. Ying and Yang must be defeated within twenty seconds of each other, or the surviving dragon will resummon the one previously defeated (which must be cleared again). There are various strategies that are used for the Dynamis Lord. 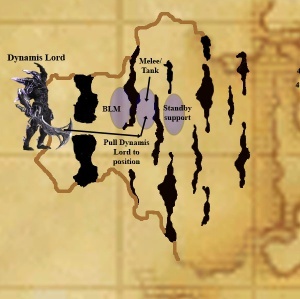 DynamisBums uses the terrain to limit the number of people exposed to the heavily-damaging AoE the Dynamis Lord users, and a few RDM/DRK to try to prevent them by using Chainspell and Stun. At some point prior to the beginning of the fight, jobs should be changed and alliances should be reconfigured towards an offensive-heavy setup. Because the point of this fight is to kill the Dynamis Lord as quickly as possible, support itself should be at a minimum. Our alliances are recreated to attempt to get as many melee as possible in a party with a BRD to boost damage through Soul Voice-enhanced songs. Prior to pull: if necessary, Chainspell and Invicible orders are determined and announced. 1 minute prior to pull: Alliances finish casting buffs. 45-30 seconds prior to pull: BRDs use Soul Voice and appropriate songs for their party. 15 seconds prior to pull: ALL players use Poison/Venom potions to prevent being slept by Dynamis Lord's possible Sleepga cast. At this point, no players should be casting spells or resting. Pull: One player pulls Dynamis Lord from its position at Castle Zvhal (avatar, Shadowbind, etc.) and brings it towards the melee/tank position. First PLD Provokes and Flashes the Dynamis Lord and uses Invincible once it is within range of both the melee and the BLMs on the cliff above to fix it in position. First RDM/DRK begins Chainspell and Stun, preventing the Dynamis Lord from acting or casting any spells. Note: It is imperative that both the PLD and RDM act quickly to prevent the Dynamis Lord from casting or damaging the waiting alliances. While the Dynamis Lord is stunned, melee alliances rush in to apply damage as quickly as possible. Next in Invincible and Chainspell orders should be used as necessary, repeating until Dynamis Lord has been defeated. Dynamis Lord will occasionally summon copies of itself when using Tera Slash and Oblivion Smash. Dynamis Lord will resummon Ying and Yang 90 seconds after being pulled. Ying and Yang can be pulled away, but they will occasionally lose hate to assist the Dynamis Lord. Defeating Dynamis Lord does not grant a time extension. Members of the alliance "defeating" the Dynamis Lord receive the title "Lifter of Shadows." Scattered through Dynamis-Xarcabard are various animated weapons, which drop fragments used for relic weapon upgrades. Prior to defeat of all 15 of the Demon NMs (and receipt of the "The prison of souls has set free its captive spirits!" message), these weapons are mere placeholders which drop nothing when defeated. Again, you MUST defeat all 15 of the Demon NMs in order for the fragments to drop!!! Read the General Advice below the following table for further information. The basic strategy is very simple: alliances buff appropriately; one player (usually a THF) aggros the animated weapon by proximity and runs away, training away the summoned Satellite pets; tanks pull the Animated weapon itself from the link; alliances kill the Animated weapon as soon as possible, preventing attempts to Warp by stunning it. Vanguard Eyes have HP low enough that they can be killed by a party of BLMs casting a serious of tier III -ga spells when unresisted. Beware that this can also be applied to the Vanguard Eyes that spawn the Demon NMs. 3 Vanguard Eyes are at a tower located in the upper-left corner of (H-8) (X: 154 Y: -20 Z: -41). 3 Vanguard Eyes are at a tower located in the lower-left corner of (H-8) (X: 119 Y: -28 Z: -117). 3 Vanguard Eyes are at a tower located in the lower-left corner of (G-8) (X: -4 Y: -28 Z:-101). 3 Vanguard Eyes are at a tower located in the lower-middle of (G-8) (X: 39 Y: -28 Z: -134). 3 Vanguard Eyes are at a tower located in the upper-middle of (G-9) (X: 61 Y: -28 Z: -196). DO NOT KILL ANY ONE OF THE VANGUARD EYES WITHOUT LETTING IT FIRST SPAWN THE DEMON NM!!! (Smaller groups) It is possible to get many of the time extensions with limited or planned sacrifice pulls. Demon NMs: Use the terrain and platforms to your advantage while kiting. Demon NMs are susceptible to Bind, but are immune to Gravity and Sleep. Because of the inability to be slept, DoTs should be applied to kited NMs for extra damage. Dynamis Lord: Job abilities (such as Angon) and spells (such as the ninjutsu elemental series) can be used to help debuff the Dynamis Lord for increased damage. Dynamis Lord: Behavior of the Dynamis Lord has been modified, making "zombie" strategies very difficult to prolong with the aspects of double weakness and loss of hate regardless of applied DoT if the source player is KO'd. Dynamis Lord: Reserve PLDs and RDM/DRKs using Invincible and Chainspell should initially be a distance away to avoid being prematurely killed by AoE. These players must be ready to take over quickly so the transition is seamless. Map and notes about time extension 382 here. Map and notes about time extension 454 here.